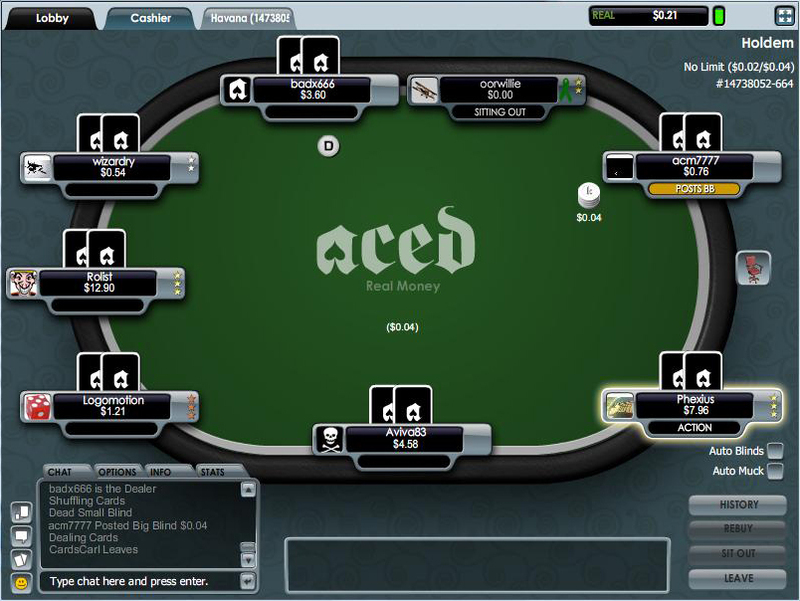 Founded only in 2008 Aced is the youngest poker room in our range of offers, as well as the youngest room using Merge Poker software. In the short amount of time the new poker room has been around Aced has however already managed to acquire a very good reputation, the good poker bonus offer only being one of the reasons. The loyalty programme with numerous rewards and constantly improving offers for VIP players is amongst the better and more innovative programmes in online poker. You will find that as a poker player at Aced activity will really pay off. Aced managed to become quite renowned in such a short time due to some innovative promotions and their attempts to come up with new ideas. Sometimes these attempts produce only short lived results (some may remember the signing of Jamie Gould as representative, only for Aced and Jamie to part ways again a month or so later) but it shows they are willing to try to improve their service. Personally we believe nearly anything is better than a poker room that is at a standstill. Take into consideration that Aced also accepts US poker players (which as we all know is not something that can be taken for granted in online poker with the complicated current situation) and you will know why this poker room grows so quickly and can sport a steady amount of players all around the clock. Aced's poker bonus is amongst the best and highest (which sadly doesn't go hand in hand a lot of times) in online poker. Your first deposit will be matched by Aced with a 100% poker bonus up to $500. You will also be able to win extra cash while playing poker at Aced if you are lucky enough to win a hand with 4 Aces or a Royal Flush. Admittedly this won't happen every day but it is nonetheless a nice (and substantial) bonus to receive up to 100 times the big blind additionally to the pot. In a $5/$10 cash game that would amount to an extra $1,000 that will be added to your pot if you win it with a Royal Flush! You will be able to earn so called VIP Points for participating in Cash Games and by paying tournament fees. Additionally Aced offers you a multitude of options that allow you to gather extra points along the way - the whole promotion is known (and well known already we might add) as Aced Poker Outs. You will for example receive 5 VIP Points for winning twice in a row in a cash game. If you extend that to 3 or even 5 in a row you will gain a further 25 or 100 points respectively. You will also be credited with extra points (50) if you win an All-In bet - all in all you can gather points in 18 different ways in cash games. But you will not only be able to collect points in ring games but by participating in tournaments. It would take too long to list all the opportunities to do so and would be a tedious task. Instead you will be able to find a thorough listing of this Outs system at the Aced website which convinces with a sober and easy to navigate layout. While the Bad Beat Jackpot offered may not be an extraordinary feature as it is being offered in various poker rooms by now it should nonetheless be noted. Where Aced's software excels however is at the attempt to push the online poker experience further towards a live poker experience by giving the players some extra options like the ability to show only one card when folding. This can puzzle and confuse opponents much more than not showing them any card if used correctly and may well help you to win the next pot. A real noteworthy special feature is the so called Deal It Twice option - the more accomplished poker players among you may have used that in live poker already. If you frequently watch poker on TV you might also have seen this before. When two players are in an All-In showdown they may agree to let Turn and River be dealt twice and split the pot between those two hands. And yes, Aced allows you to do just that (depending on the table you are at) if both players agree to the deal. That helps bring the live poker feeling right to your monitor and gives you even more options and things to consider. Aced has a habit of making players feel at home and keeping their affiliates (such as us) on their toes. How so? Well, they simply keep improving their offers and we are left to update our reviews and bonus info so frequently it isn't funny anymore. Actually, yes, it is. Simply because we enjoy an active poker room that doesn't just stagnate in its existing features. So what does Aced have to offer you? They have recently introduced their new software (version 4.5 - starting to get an idea of just how many times they update and improve their client?) that - amongst other things - brought with it a whole new VIP programme. Not only will you be able to do more with your VIP points, you will also find that they introduced a new weekly $50,000 guaranteed tournament as well as exclusive freerolls for each level of the VIP Programme. Some of the new features include a fully customisable poker table (including table backgrounds, table floors, table rails, card backs,...) and the Heads Up Sit'n'Go Rematch which allows you to simply arrange a rematch. It may not sound like much but if you like to play heads up games you will really start to enjoy that option. 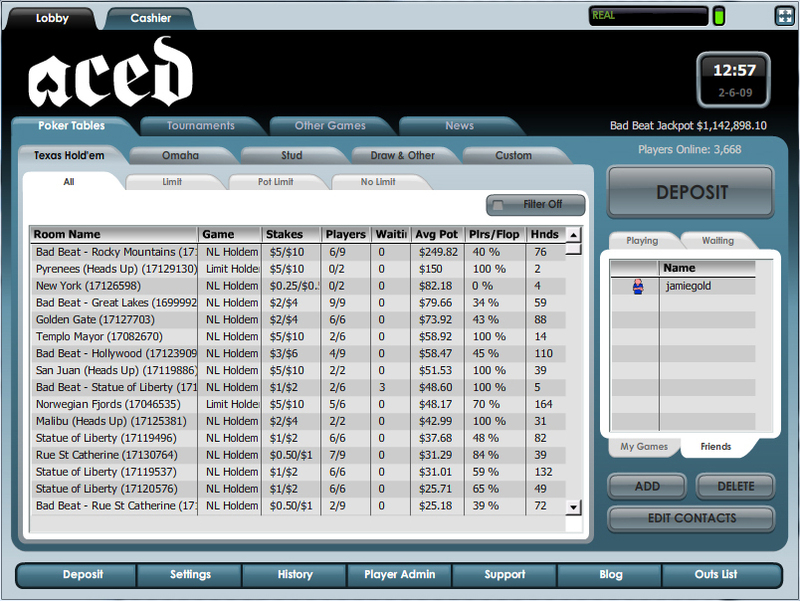 A lot of players will also enjoy the effort Aced put into providing a good solution for multi-tablers. You will find that the Poker Game Mini Mode will be of great help. It basically allows you to simplify the user interface on any given window individually and have small resolution windows that stay legible. Together with the Poker Game Grid Mode that will let you arrange windows in any grid combination up to 5x5 you will really be able to make most of your multi-tabling experience. We cannot tell you how impressed we were with the effort and idea put into it all. You will have to see it in order to appreciate just how well this all works together (especially with the customisable layout). The software itself is very stable and the interface is pleasing and nicely laid out. Unfortunately Aced is offered exclusively for MS Windows, there is no flash nor Mac variant available at the time. The support is able and anxious to help and is there for you 24 hours a day. Real money players can make use of a live chat function for immediate assistance while play money players will have to rely on the regular e-mail support. Aced Poker may be the youngest of the poker rooms that we are presenting on our site but they already are up to par with any of the established online poker rooms. Several special programmes and promotions, a very good poker bonus, a dynamic and innovative team and a rapidly growing amount of players guarantee you a great poker experience.